HMS Inflexible. 4"/40 (10.2 cm) guns can be seen on top of "A" and "X" turrets. IWM photograph Q 39267. 4"/40 (10.2 cm) guns salvaged from HMS Pegasus being used as field artillery in Africa. IWM photograph Q 52493. This gun was originally designed for the small cruisers of the 1890s. 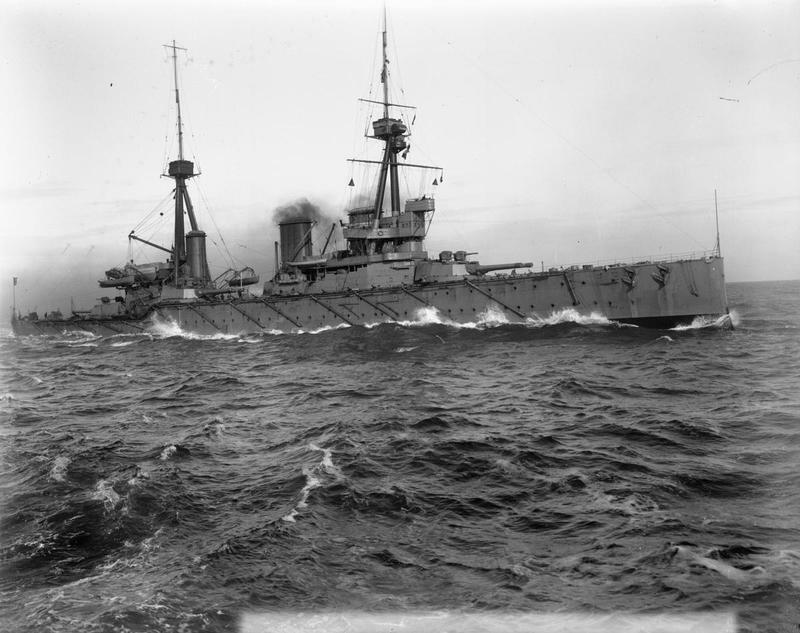 Later, after the successors to Lord Fisher decided that the 3"/50 (7.62 cm) secondary weapons of HMS Dreadnought were too small a caliber to be effective as an anti-torpedo boat gun, the 4"/40 (10.2 cm) was selected to arm the Invincible class battlecruisers. However, even these guns were found to be too weak and they were in turn replaced with by the more powerful 4"/50 (10.2 cm) Mark VII on later capital ships and finally by 6"/45 (15.2 cm) guns on the last "super dreadnought" designs of the World War I period. After HMS Pegasus was sunk by the German cruiser Königsberg in 1914, six of her guns were salvaged and then used in Africa as field artillery and in coastal defenses. During World War II, many of these guns were used on minor warships and a few of the older destroyers. Some were also employed in coastal batteries. The Mark I and Mark III had similar ballistic performance, but differed in construction. The Mark I had an A tube with short chamber liner, half length wire, full length jacket and a screw breech ring connected the jacket to the breech bush over the A tube. Mark IA differed in that the A tube was thicker over the front of the chamber. The Mark III had an A tube, wire of reduced length, B tube and jacket with a screwed C hoop connecting them. Ten Mark I, eight Mark IA and 261 Mark III guns were manufactured. There were also seven Mark I/III built like the Mark III but with the breech ring and bush as the Mark I. Five of these were later converted entirely to the Mark III design and then designated as the Mark III*. The Mark II was a trunnioned gun of the same performance as the Mark I. Eight of these guns were produced to rearm the old battleship Temeraire and the paddle steamer Sphinx. ^This may have been the only gun for which Cordite MD was manufactured in a tubular form as well as in cords. ^Original outfit for Inflexible was 50 CP and 50 HE, later changed to 30 CP and 70 HE. ^Invincible was sunk with these guns but Indomitable was rearmed with the 4"/45 (10.2 cm) Mark VII in April 1917 and Inflexible was rearmed with the 4"/45 (10.2 cm) Mark IX in July 1917.